And, now for our next installment of Low, Slow and So Worth It. Today we're talking turkey, well, actually chicken. And, this is about as simple as it gets. One pot, one chicken. Add heat and a lid. I took inspiration from two recipes. The first is the French Chicken in a Pot from The Barefoot Cook. The second is from Lubbock Online. Both of those writers are actually riffing off the French Chicken in a Pot from Cook's Illustrated. The picture above is the Before. Well, it's actually more of the During, really. The chicken has some color on it but it's still perfectly raw inside. The photo below is the After - herbs and salt were added to the bird and it was done cooking. I think the first photo is a bit prettier. But, don't just the finished chicken by her looks - she was darn juicy and tasty! I was going to type out the recipe, but why bother. All three of the sites listed above did a nice job. If you have a subscription to Cook's Illustrated (or a their 30 day free trial) their link above will get you the original recipe. Basically, take the thawed chicken and toss it breast-side down in a hot dutch oven for about 5 minutes to get some color on it. Then carefully flip it over and toss some herbs and veggies in if you please. Stick a lid on it and pop it in a 250 degree oven and cook it low and slow. Cook until instant-read thermometer registers 160 degrees when inserted in thickest part of breast and 175 degrees in thickest part of thigh, 80 to 110 minutes. 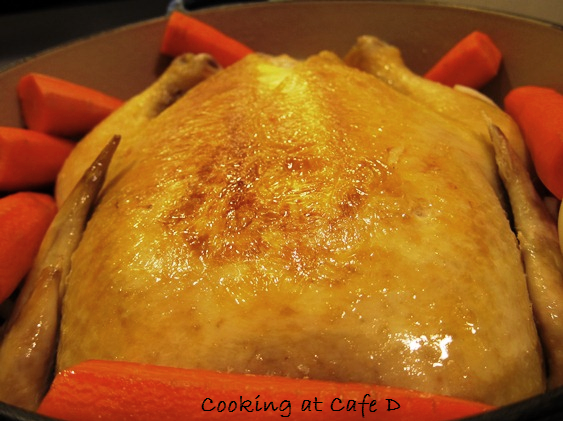 For a 3 1/2- to 4 1/2-pound chicken it will take about an hour to cook. A 5- to 6-pound bird will take close to 2 hours. As you can see from the pics above, I tossed some carrots in the pot. Next time I won't bother. I'll just make a sheet pan of slow roasted vegetables. 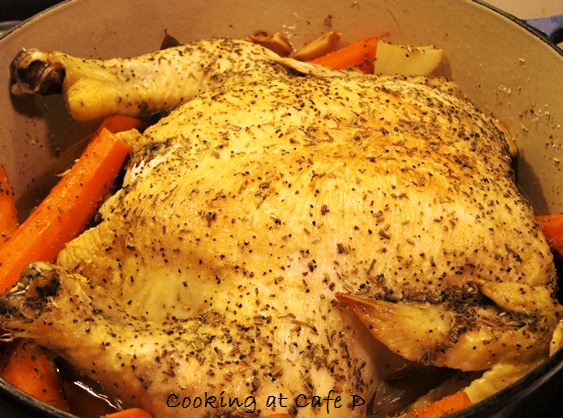 Have you ever made Dutch Oven Chicken? What's your favorite use for leftover chicken? Tell us here... or join us on Facebook.